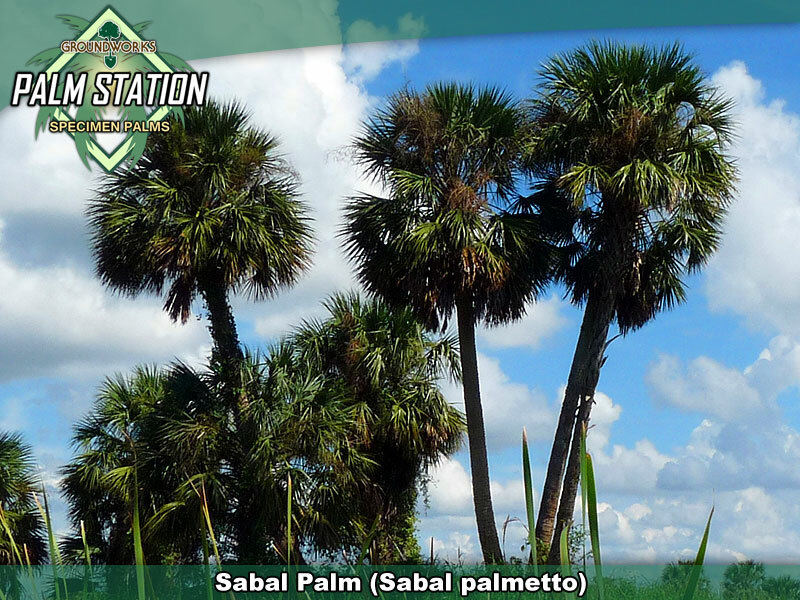 Sabal Palms are tough and versatile. The trunks are heavy and the canopies dark green. This stately palm likes wet feet and can be used where so many other varieties will fail due to inundated conditions. Sabals are a large, robust palm that is a very slow grower reaching as large as 40 ft or so over its nearly 100 year plus life span. The crown is of medium size being 12-14 ft across at maturity. Like many palms the crown is typically wider when grown in shade and more compact when grown in full sun. The large fronds are a medium green in color and the canopies will become fairly thick when the palms are grown in full sun. In mid-summer the cabbage palm bears creamy white flowers on a long branched inflorescence that is held completely within the crown. Flowers are followed in late fall or early winter by black spherical fruit that is about one third of an inch in diameter. This southeastern U.S. native palm occurs near the coast, from the North Carolina barrier islands to South Carolina, to Georgia, down to the Florida Keys and then up the Gulf Coast to the northwestern Florida panhandle. It is often planted all along the Gulf Coast and has been utilized with great success in Texas and Louisiana. 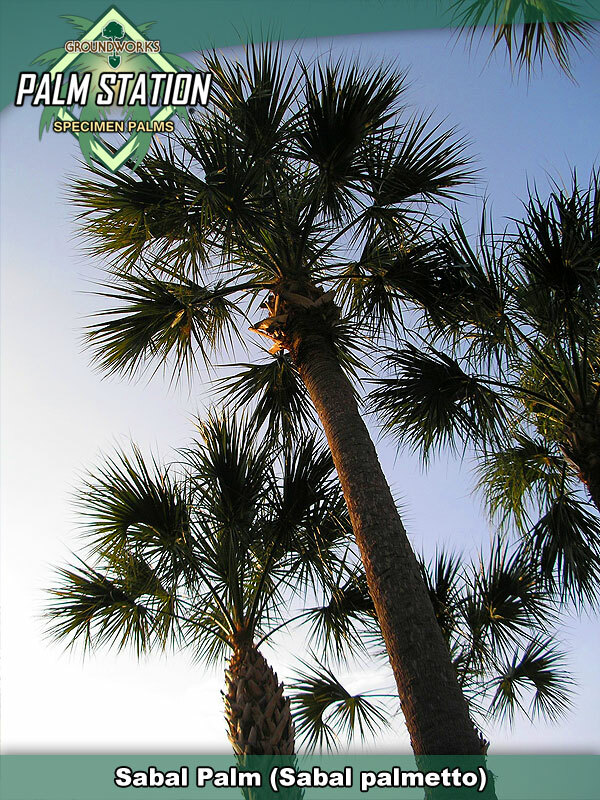 Sabal palmetto is very salt and drought tolerant and can be used in beachside plantings. It is able to adapt to most types of soil. Cabbage palms are easy to transplant if they have at least six feet of trunk. Commercially the palmetto is dug from the wild and all of the leaves are cut from the trunk (care is taken not to damage the tender bud). All of the roots are cut back as well (cut sabal roots die back anyway and new ones grow directly from the trunk). The palms are commonly delivered in this state but they are also available in a “regenerated“ state. Regens are freshly dug palms that have been harvested and then planted & nurtured over a 12 month period to regenerate the root systems and canopies before being sold for ornamental applications. Full sunlight to some shade. Trunk development is suppressed in heavily shaded specimens. Super versatile and very adaptable. After establishment, Sabals tolerate drought, standing water and brackish water. USDA Zones 8-10. This is a cold hardy palm that survives hard freezes to 15 degrees with no issues. 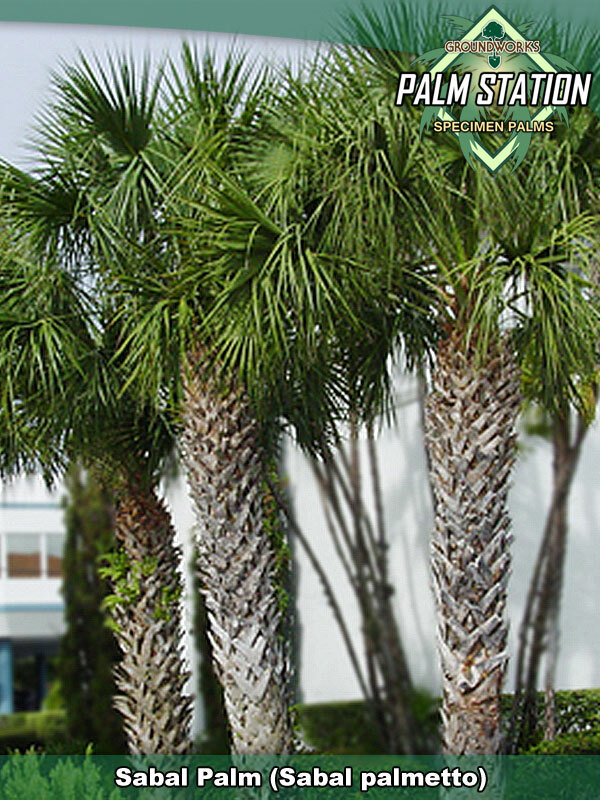 The cabbage palm is widely utilized in landscaping. In streetscapes, as a accent palms and in a wide variety of other applications, Sabals are available with straight trunks that are either “booted” (thatch on) or “clear” (Thatch removed leaving a smooth trunk appearance). Sabals are also available with unique curves and character. Where used in dense roadway plantings, the palm groves refresh the eye and absorb the road noise providing a calming influence for both motorists and the environment. Cabbage palm is very low maintenance and drought resistant making if a perfect choice for urban plantings. Groundworks stocks Sabals as both “Regens” and freshly dug in sizes ranging from 8’ to 20’ of clear trunk. Where unusual curves are required, we can special order them and then set the palms up for your inspection and hand selection at our nurturing facilities in Alvin or Spring Texas and at our Boynton Beach Florida nurturing facility.